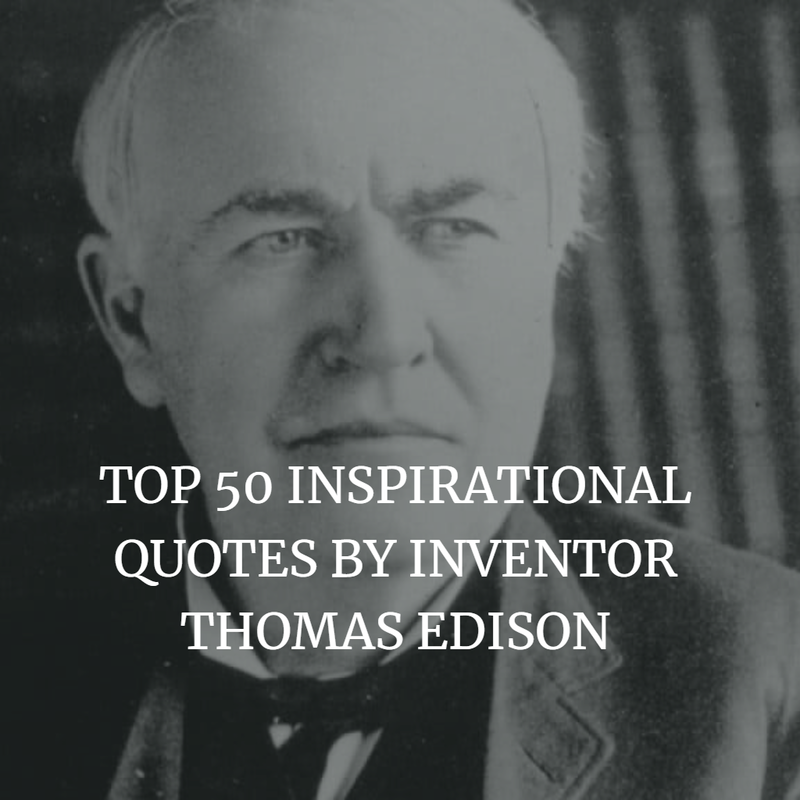 Thomas Edison Top 50 Motivation Quotes and inspiring Sayings. 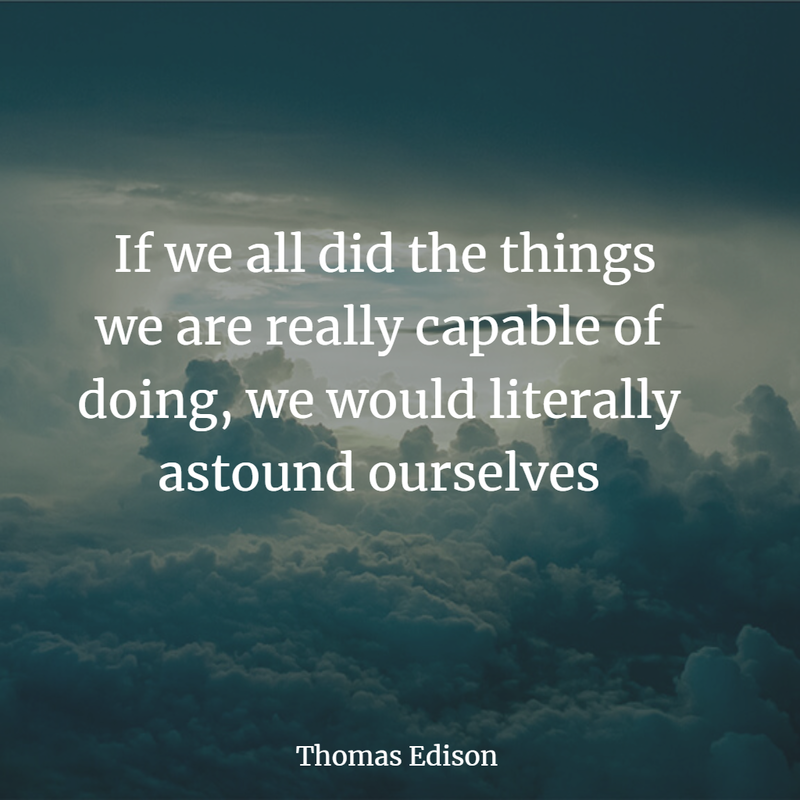 Motivational Quotes from The man who invented 1,093 patents (singly or jointly) and was the driving force behind such innovations as the phonograph, the incandescent light bulb and one of the earliest motion picture cameras. He also created the world's first industrial research laboratory. Born in 1847, Edison would witness tremendous change during his lifetime. 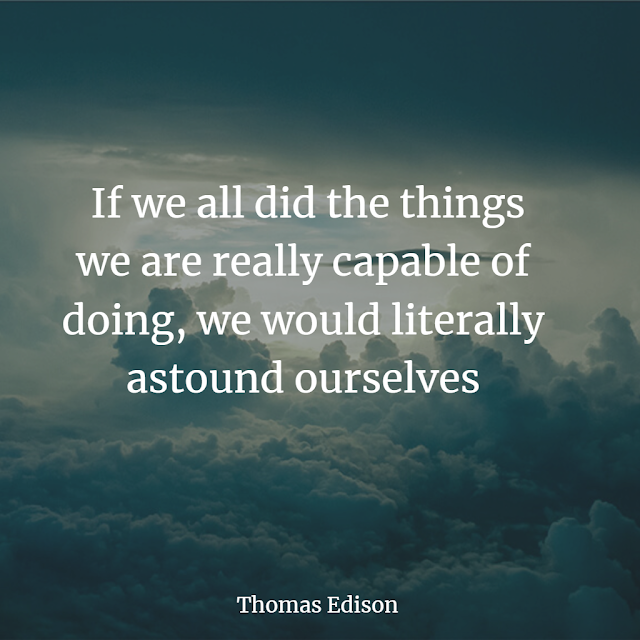 ... Edison invented or refined devices that made a profound impact on how people lived. The most famous of his inventions was the incandescent light bulb (1878), which would revolutionize indoor lighting and forever separate light from the fire. 1. 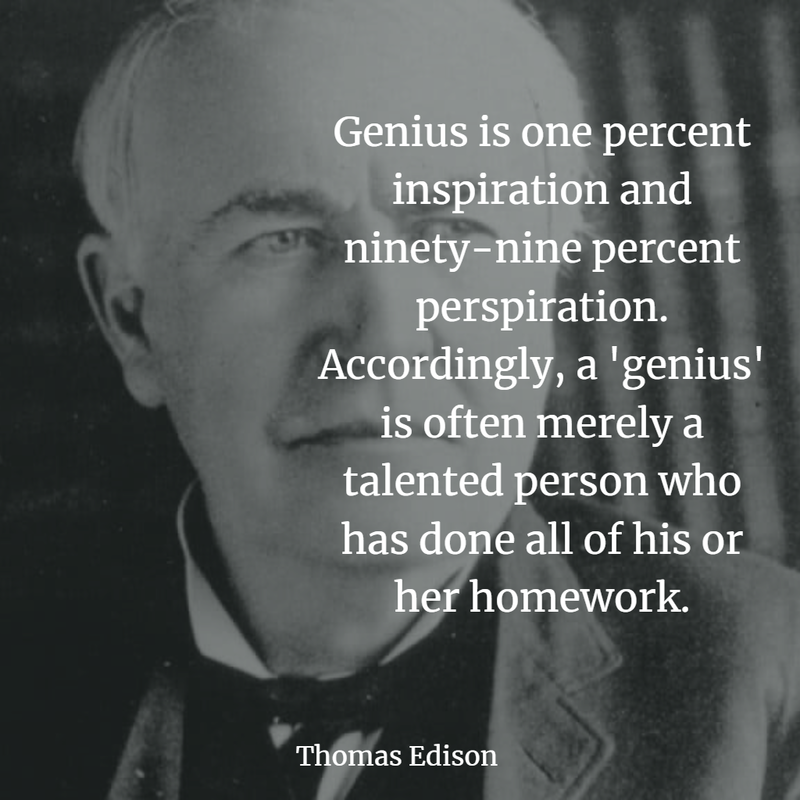 Genius is one percent inspiration and ninety-nine percent perspiration. Accordingly, a 'genius' is often merely a talented person who has done all of his or her homework. 2. Opportunity is missed by most people because it is dressed in overalls and looks like work. 4. I never did anything worth doing entirely by accident... Almost none of my inventions came about totally by accident. They were achieved by having trained me to endure and tolerate hard work. 5. Personally, I enjoy working for about 18 hours a day. Besides the short catnaps I take each day, I average about four to five hours of sleep per night. 9. 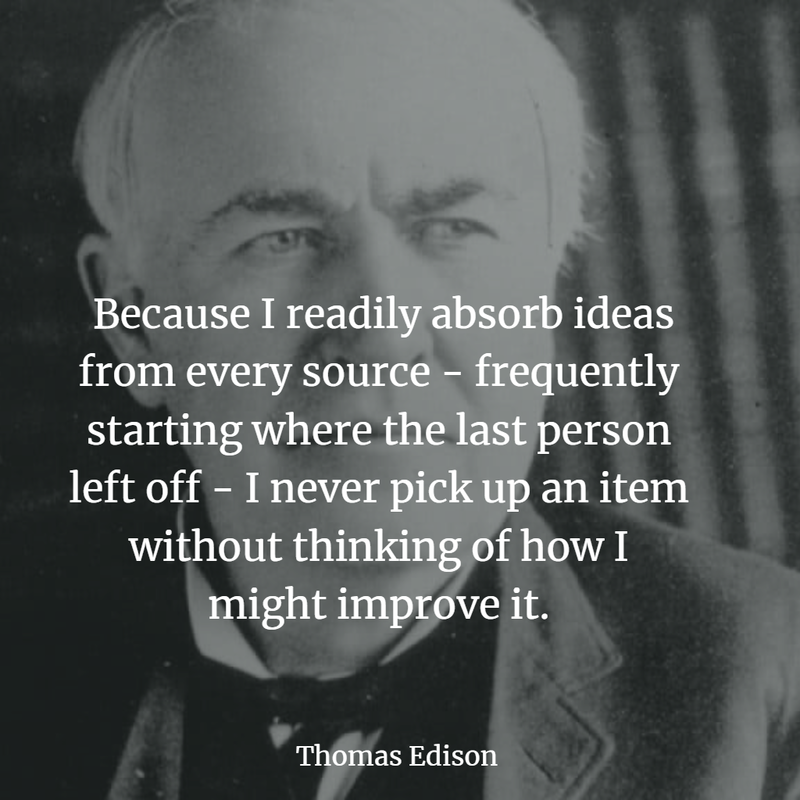 Because I readily absorb ideas from every source - frequently starting where the last person left off - I never pick up an item without thinking of how I might improve it. 10. I am not overly impressed by the great names and reputations of those who might be trying to beat me to an invention.... It's their 'ideas' that appeal to me. 15. Most of the exercise I get is from standing and walking around laboratory tables all day. I derive more benefit and entertainment from this than some of my friends and competitors get from playing games like golf. 20. Many of life's failures are experienced by people who did not realize how close they were to success when they gave up. 21. Pretty much everything will come to him who hustles while he waits. I believe that restlessness is discontent, and discontent is merely the first necessity of progress. Show me a thoroughly satisfied man and I will show you a failure. 22. Unfortunately, there seems to be far more opportunity out there than ability... We should remember that good fortune often happens when opportunity meets with preparation. 26. Surprises and reverses can serve as an incentive for great accomplishment. There are no rules here, we're just trying to accomplish something. 27. As a cure for worrying, work is far better than whiskey. I always found that, if I began to worry, the best thing I could do was focus upon doing something useful and then work very hard at it. Soon, I would forget what was troubling me. 28. Barring serious accidents, if you are not preoccupied with worry and you work hard, you can look forward to a reasonably lengthy existence.... It's not the hard work that kills, it's the worrying that kills. 29. The only time I really become discouraged is when I think of all the things I would like to do and the little time I have in which to do them. 30. The thing I lose patience with the most is the clock. Its hands move too fast. 32. From his neck down a man is worth a couple of dollars a day, from his neck up he is worth anything that his brain can produce. 33. The doctor of the future will give no medicine but will interest his patients in the care of the human body, in diet, and in the cause and prevention of disease. 34. Whatever the mind of man creates, should be controlled by man's character. 35. Even though I am nearly deaf, I seem to be gifted with a kind of inner hearing which enables me to detect sounds and noises which the ordinary person does not hear. 36. I love great music and art, but I think 'cubist' songs and paintings are hideous. 37. Someday, man will harness the rise and fall of the tides, imprison the power of the sun, and release atomic power. 38. I am both pleased but astonished by the fact that mankind has not yet begun to use all the means and devices that are available for destruction. I hope that such weapons are never manufactured in quantity. 41. To me, the idea and expectation that the day is slowly and surely coming when we will be able to honestly say we are our brother's keeper and not his oppressor is very beautiful. 43. It's obvious that we don't know one-millionth of one percent about anything. 44. I believe that the science of chemistry alone almost proves the existence of an intelligent creator. 45. We have merely scratched the surface of the store of knowledge which will come to us. I believe that we are now, a-tremble on the verge of vast discoveries - discoveries so wondrously important they will upset the present trend of human thought and start it along completely new lines. 46. Be courageous! Whatever setbacks America has encountered, it has always emerged as a stronger and more prosperous nation... Be as brave as your fathers before you. Have faith and go forward! 50. Great music and art are earthly wonders, but I think 'cubist' songs and paintings are hideous. 51. Even though I am nearly deaf, I seem to be gifted with a kind of inner hearing which enables me to detect sounds and noises which the ordinary listener does not hear.